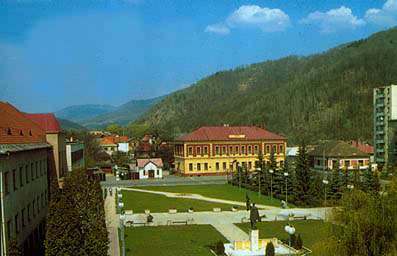 Town named Hnúšťa with 7600 inhabitants is situated in a basin which is placed in the middle of Slovenské Rudohorie (mountain range). The basin is surrounded by several mounts: Sinec (916 m), Ostrá (1012 m), Štepov Vrch, Brandzová and Brezina. Rimava – a river flows through the town. It springs below Fabova Hoľa (a hill). The river basin is called Rimavská dolina. It was celebrated in poems of Janko Fracisci-Rimavský – a compatriot of Hnúšťa who dedicated his life to fight for rights of Slovak people. The town was populated already in the year 1334, which proves a list of pope tax collectors. There is an offer of marked paths leading to Sinec and Ostrá hills. 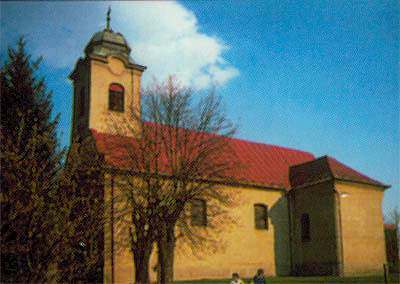 However, the most interesting is Hradná magistrála connecting two castles Fiľakovo and Muráň castles. Total length of the route is 78 km. It leads the way from Fiľakovo through Rimavská Sobota, Horné Zahorany, Kraskovo, Brezina, Tŕstie to Muráň. This route was used by Fraňo Wesselenyi as he went to see Mária Széchy (“Venus of Muráň”) from Fiľakovo castle to the castle of Muráň. The whole track of Hradná Magistrála is often used to be called “The route of Mária Széchy”. It is marked by red tourist mark and it crosses several roads and short marked paths which can be used for terminating the march in optional places. Several tourist and cycling paths join the rout from the following villages: Rimavská Sobota, Veľké Teriakovce, Vyšný Skálnik, Kraskovo, Rimavské Brezovo, Tisovec. These are signed in tourist map of Slovenské Rudohorie in the part of Stolické Vrchy (mountains). Challenging the Hradná Magistrála one has a lot of opportunities to see beauties of Slovak nature, changes in the woody landscapes and meadowy cols. Mountain settlements, high positioned villages are to be seen. One is given to view mountains such as Sinec, Klenovský Vepor and Hradová or can climb up to Tŕstie and continue on to Muráň castle. The surrounding nature does not provide beauties of sight only. It has a richness of forest fruits as bilberries, raspberries, cranberries and mashrooms. Beside the beautiful nature there are several cultural monuments along the route. They are for instance churches in Rimavská Baňa, Rimavský Brezov, Kraskov, Kyjatice, Brádno (all of them contain very precious and impressive interiors). Village Kyjatice has a europian unique finding of a burying ground from Bronze Age – from the 11th to the 7th century B.C. In the summer, there is a possibility of visiting water dams Teplý Vrch and Klenov. In the winter season one can ski on the slopes of Sinec and near villages Tisovský Bánov, Rejkov, Klenovská Skorušina and in the recreational center Krokava which is only 20 km far from Hnúšťa. 1) Hotel Robotnícky dom with restaurant and wine-room. The hotel was recently reconstructed and has a very nice interior. Capacity of 56 beds in one and two bedded rooms and possible third bed with facilities. The wine room has a dance floor. The restaurant's capacity is 100 seats and the wine room 100 seats, too. 2) Accommodation establishment Ubyka-Igor Hrivnákj, Hnúšťa, Daxnerova 906. The facility is renewed and suitable for lodging. capacity 48 beds, without board. 4) Reštaurácia Hubert – Marian Šulek, Daxnerova ulica (street), Hnúšťa. Restaurant and spacious hall is suitable for organizing courses, seminaries and meetings. Possibility of refreshment, lunch and dinner. 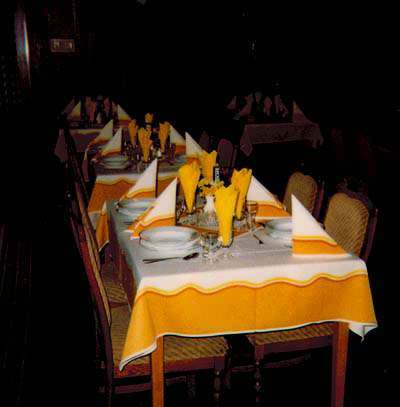 5) Small restaurant establishment Koliba – Štefan Szabó, Hlavná ulica, Hnúšťa. The restaurant offers a very agreeable ambient with refreshment, lunch and dinner in a shed styled impressive interior.